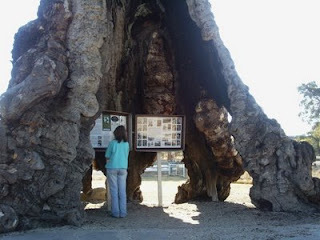 I can't tell you much about the tree other than the Herbig family (who were among the first pioneers to settle in the region) made the huge hollowed out tree trunk into their first home. Apparently the hollow nature of the trunk was caused by lightening strikes - though I'm not sure - that's just what I gleaned from Rose who told me a little bit of the history while I was busy taking photographs. I do know that the tree is well over one hundred years old and used to be much taller. At some point the top part of the tree collapsed but has since grown back to the slightly bonsai-ed look you see today. 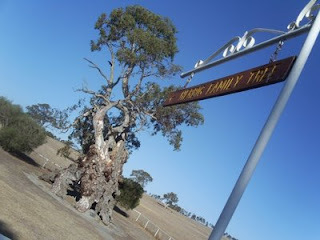 Although it is quite a drive to see the Herbig Family tree, you can make your trip even more worthwhile by traveling to Springton via the road that leads from Williamstown (perhaps after a visit to the Whispering Wall). The scenery is just superb with many hills that I swear would be just perfect for a fairy castle on the summit.